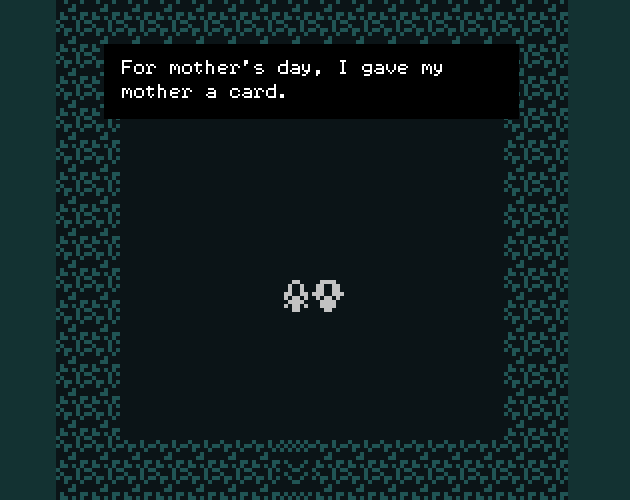 A short game about my mother and me. Pick up all the items and talk to all the people or else it won't make much sense. There are invisible walls in the game, like there are around people. click the window and then use the arrow keys or hit enter to start. use the arrow keys or wasd to move (or swipe if you're on mobile). descriptive transcript available for download. Music by ExPsyle. Bitsy by Adam LeDoux. My love to Laiska. Extremely relatable, ooh boy. Not ashamed to admit that I got a li'l misty eyed. It's always powerful when a creator shares a deeply personal story. Thanks for doing so. This was intense, and painful, and beautiful. This touched me so much. "I am a rose sprouted from the soil my mother laid down, Thorns and all." this was wonderful. thank you for making and sharing. This game is truly beautiful. Thank you Lore.